A man and his young son were rushed to hospital after they were found by ambulance workers at the bottom of a hotel pool in cardiac arrest. Toddler in critical condition after being rescued from pool at Marriott Residence Inn on Lincoln Ave.
A 36-year-old man died in hospital Wednesday evening, while his two-year-old son remains in critical condition, after they were found in cardiac arrest at the bottom of a hotel pool. 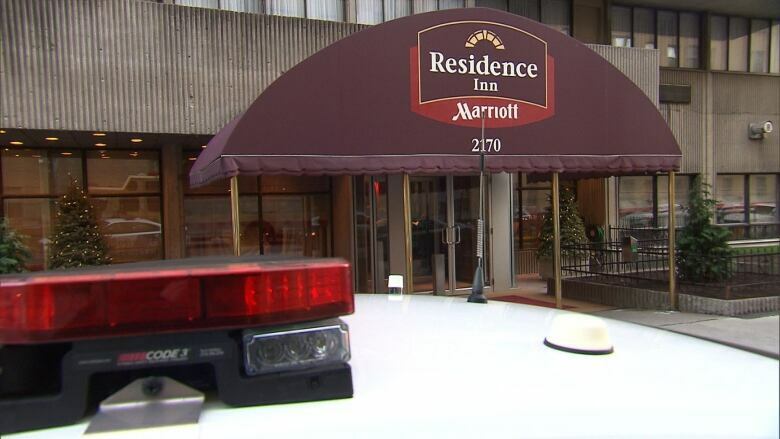 The two, who are tourists from the United States, were found unconscious after a 911 call was placed at around 6:30 p.m. for a possible drowning at the Marriott Residence Inn on Lincoln Ave. They were in the indoor pool located on the 18th floor of the hotel. First responders "did some manoeuvres on them. They were still unconscious when they were transported to hospital," said Montreal police spokesman Jean-Pierre Brabant. Police said it's possible the man may have suddenly felt unwell while he was in the pool. "The first hypothesis we are looking at is that the man maybe suffered a heart attack … Was the boy in his arms, or was he near the pool and he went to check on his father? He's two, he didn't know how to swim so he went under, too," Brabant said.